Greenwich is the home of the Greenwich (or Prime) Meridian, which splits the globe into East and West, and is responsible for setting the world clock on zero degrees longitude. Apart from this curious distinction (which has earned Greenwich UNESCO World Heritage Site status), Greenwich has a host of other attractions, including the Greenwich Market with its variety of arts, crafts, food and bric-a-brac, Sir Christopher Wren's Royal Observatory, and the National Maritime Museum. Greenwich Park is beautifully landscaped and is an ideal location for a picnic lunch. 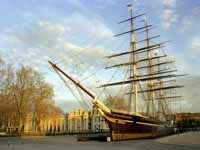 The famous tea-clipper ship, the Cutty Sark, was damaged by a fire in 2007 but has been extensively restored and is once again open to the public. Opening times: Opening times vary for each attraction - check the website for details. Admission: Admission costs vary for the different museums and exhibitions and various combination tickets are available.